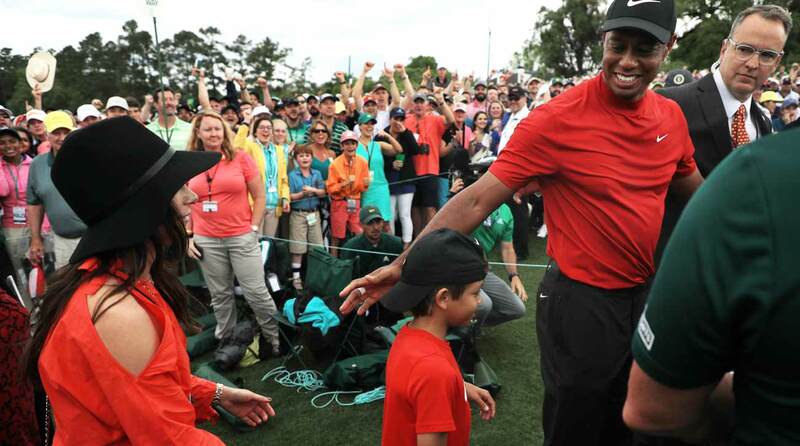 AUGUSTA, Ga. — As Tiger Woods came down the stretch at Augusta National on Sunday, his family huddled together in the clubhouse. His girlfriend Erica Herman had been there all week, while his his kids, Sam and Charlie, flew up this morning. His mother, who has been by Tiger’s side every step of the way, was there as well. 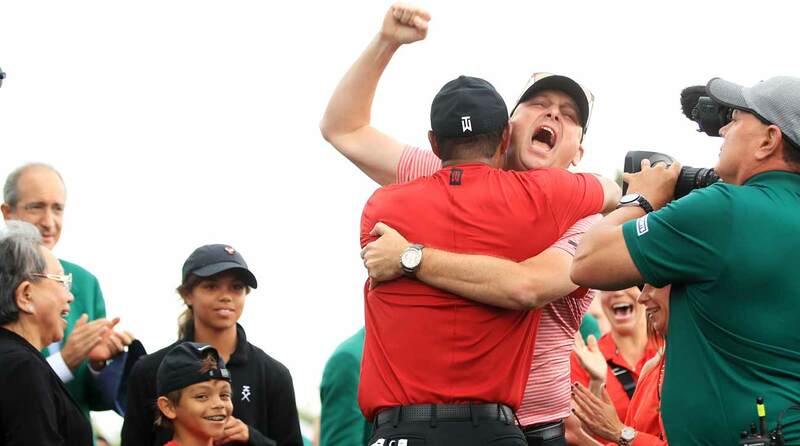 The scene was tense as Woods played out the back nine en route to his 15th major championship. It wasn’t until last night that Woods and his team made a travel plan for his kids. They flew up Sunday morning from Florida, arriving just too late to see him before his tee time, but got on property as he headed down the first. Sam and Charlie walked much of the front nine alongside Woods’ close friend and advisor Rob McNamara, but as the final group made the turn, they came inside. “We walked the front nine and then we kinda came in on the back nine — they had a tough time seeing,” McNamara said. Crowds were more than a dozen deep in spots as fans rushed around, trying desperately to keep tabs on the fast-changing action and spot their own piece of history. Tida was inside the whole time, watching excitedly as her son drew closer to major No. 15. “She was mostly camped out inside and she was right there, yelling in the grill room,” McNamara said. The entire grill room, adjacent the players’ locker room, was packed. Golfers who had finished their rounds crowded in, taking the action on television amongst members, guests and staff. Tida held court alongside her family as the scene grew increasingly tense — and a win drew nigh. McNamara described the emotions in the room. As Woods’ ball landed safely on the 18th fairway, nursing a two-shot lead, his family made their way out of the clubhouse, past the big oak tree and down the hill to behind the 18th green. From there, they could see as Woods just missed a meaningless par putt but tapped in the next one — the important one — to seal the deal. First, there was a hug with Charlie, wearing a red t-shirt, black shorts and a backwards black Nike cap. Woods grabbed his son and picked him up, grasping him tight in his arms as he yelled alongside him. It was a father-son moment neither of them had ever quite experienced. Then came hugs for Sam, and for Tida, and for Erica. Woods recalled afterwards the hug he’d shared with his ailing father after his first win, 22 years ago. “My dad shouldn’t have come in ’97. I mean, he had heart complications, and wasn’t supposed to fly, but he flew and came. Gave me a putting lesson on Wednesday night, and the rest is history. “My dad’s no longer here, but my mom’s here, 22 years later, and I happen to win the tournament; and then to have both Sam and Charlie here, they were there at the British Open last year when I had the lead on that back nine, and I made a few mistakes, cost myself a chance to win The Open title. What did Woods say to his kids? “Well, I definitely didn’t hear them, because I was screaming. I think everyone else was, too,” Woods said. And then there was a moment with McNamara. Tiger Woods and Rob McNamara shared a moment behind the 18th green. Woods has been through plenty in recent years. His kids have been there alongside him. His entire family has. That wasn’t lost on him. “Just their infectiousness of happiness; you know, I was going through a tough time physically,” he said. “There was a lot of times when I really couldn’t move, and so that in itself is difficult. Tiger Woods celebrated with his family after winning the 2019 Masters. As Woods made his way to the scoring area, he was greeted with an unusual sight: a legion of players, waiting to greet him post-round. Rickie Fowler and Justin Thomas, two of Woods’ closest Tour pals, were there. Xander Schauffele stuck around, too, as did Brooks Koepka. And so did a number of former Masters champions, including Bernhard Langer. “We were all up in the Champions Locker Room,” he said afterwards. “And we saw what was happening and said, ‘Let’s all put on our jackets, go down and wish him well. '” Wish him well they did; Langer and Adam Scott and Zach Johnson and Bubba Watson and Craig Stadler and others. This win was different. After the madness—or at least that particular bout—Woods’s family returned inside to the grill room. They sat and watched as Woods came on the television from Butler Cabin. Security shut down the room; just one green-jacketed member and a couple servers remained. Rickie Fowler was at the edge of the room, but was kept away. Justin Thomas came by; he wasn’t allowed in, either, but made his way through to close his tab. “We basically are family,” his mother said. Thomas caught Charlie’s eye. “Next week, I want you in a putting competition,” he said. The 10-year-old looked back confidently. “Okay!” he told Thomas. Charlie sat on a chair of his own, muddy-soled Nikes up on the off-white cushion. His father appeared on the television screen. When Tiger brought up his two children, they both grinned widely. As the interview finished, the Woods family accepted a slew of congratulations as they exited the room. They were whisked away to the front of the clubhouse, where they climbed into a van. There were celebrations to get to — and a champion to share them with.